Independent and chain pizzerias' secret to success is to create simple operation procedures that produce food with the consistent flavor, texture and appearance their customers have come to expect. FWE's line of pizza ready equipment is essential for operations looking to create standardized methods - lowering operating costs, producing consistent menu items, and helping your pizzeria operate strategically. Heated holding cabinets allow for preparation well before the mealtime rush, cooking in higher volume, producing menu items efficiently, reducing food handling and waste. Heated holding also buys time and gives operators tremendous flexibility in food production strategies. Without a better solution, many operations turn to leaving pizza boxes on top of a deck oven. This practice causes the bulk of heat to transfer to the lowest two pizza boxes on the stack. Introduction of heated holding cabinets into an operation avoids this problem and keeps pizza oven-fresh and ready-to-serve. The Proofer Heater line is an essential for pizzerias. These cabinets create a stable, controlled environment of heat and moisture which circulates gently throughout the interior of the cabinet - eliminating hot and cold spots to maintain optional levels of crispness and moisture. Controlling the cabinet environment produces uniform proofing batch to batch and allows you to create the right balance of heat and humidity to your liking. The HLC "Handy Line" series provide under-counter or counter-top placement for ease of access on the line or as a merchandise display at point of purchase. These small compartments have some of the fastest recovery times when doors are frequently opened and closed during peak periods to add or remove items. 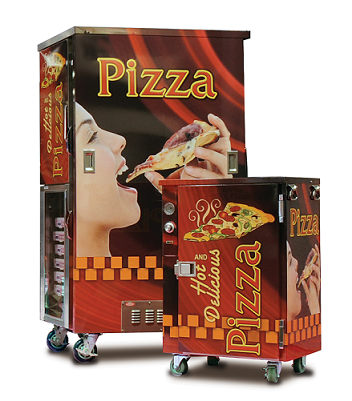 These hot box solutions provide pizzerias and convenience stores with the edge they need to succeed by increasing speed of service while maintaining food quality. Your operation can streamline food handling by creating a mobile work station. Half-size or counter top models mounted to an equipment stand keep trays close at hand. This helps in planning the cooking sequence and improves productivity. Optional Lexan doors allow everyone to keep an eye on your supply of popular menu items and finished product for service and deliveries. Pass-Thru Doors create a convenient connection from main kitchen to carry-out window. Access from both sides of the cabinet streamlines the operation. Staff is free to focus on customers, taking more orders and serving during peak meal times while carry-outs hold kitchen-fresh. FWE Pizza Ovens are built to last, the solid stainless steel construction with welded base frame is built to withstand continuous, demanding use. 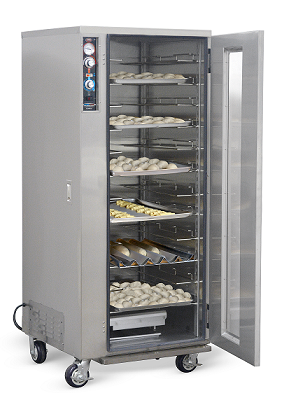 FWE food service equipment is easy-to-use with intuitive controls that do not require extensive training to operate. Simply dial-in your desired holding temperature setting, or air moisture level if you are working with a proofing unit. 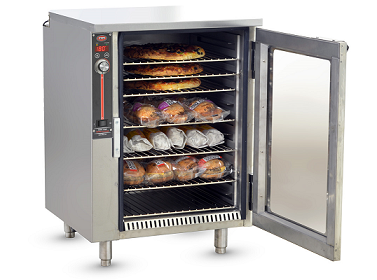 Heated holding cabinets are made to give operators tremendous flexibility in food production strategies. Many menu items beyond only pizza can be held together for short-term holding. FWE offers cabinets sized for your floor-plan foot-print: slim-line, full-size, high capacity, under-counter, trays only, for pans only, or universal trays and pans. 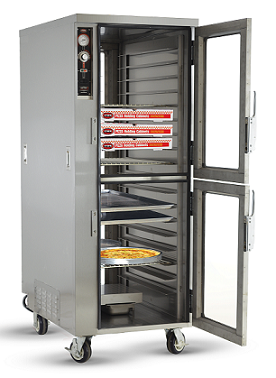 Heated holding cabinets within our pizza series can hold open or boxed pizzas up to 18". If you need a cabinet to fit a larger size pizza or carry out box, consult with our sales representatives to get exactly what you need. Additionally, FWE offers an assortment of caster wheels to choose from that allow foodservice operators high mobility and tremendous flexibility in their operations to accommodate distance and terrain. For a breakdown of different caster options, click here. With graphic wrap options your operation can use your cabinet as a bill board! Catch the eye of your customer with your custom logo, message, or menu item images. Increased visibility with countertop displays and use of Lexan doors mixed with the aroma of fresh pizza is sure to result in increased sales from hungry impulse shoppers in pizzerias, delis, clubs, convenience stores, schools and almost any foodservice operation. FWE Offers ENERGY STAR certified systems, to learn more and see a full list of certified models, visit fwe.com/energy-star. With FWE's Quick Ship program, many models are available for immediate shipment, shipping within 48 hours. Quick Ship terms and conditions apply. To learn more, visit www.fwe.com/quick-ship. FWE offers a variety of features and options for our pizza cabinets, to learn specifics, compare models, see literature, additional photos and get a quote, www.fwe.com/pizza. If you are interested in speaking to a sales representative about which pizza cabinet will best suit your operation or about other products that FWE offers, please contact sales@fwe.com. Below you’ll find various useful pages to help educate you on FWE products and information to better assist in deciding on your next order! Learn all about the technology allows you to adjust food quality characteristics instead of just “cabinet air” characteristics. Join us on YouTube for various tutorials, informative and operational videos for many of our product lines.